If you’re trying to decide whether you should move or remodel, there are several things you need to consider. DreamMaker Bath & Kitchen of Charlotte is here to help you with these considerations. Moving has quite a few hidden costs that many people don’t think about until they see the bottom line. In addition to the obvious costs of hiring movers or renting a moving truck and purchasing packing supplies, remember that you’ll have additional expenses related to the sale of a home, such as closing costs, transfer fees and real estate commissions. Other expenses you need to consider include furniture and window treatments for the new space, and many other items that will make the house a home. DreamMaker Bath & Kitchen has the best tradespeople to help you accomplish your remodeling goals. You don’t have to live with someone else’s preferences – we’re here to help you make your home your own! Before you hire kitchen remodeling contractors, your project manager will discuss what you’re looking for in your dream kitchen. If you want to change something in your bathrooms, such as updating all the fixtures or making bath-to-shower conversions, DreamMaker will bring in experts who can make your dream a reality. If you love the home where you live and your neighborhood, there is no need to move when you can remodel your existing space. 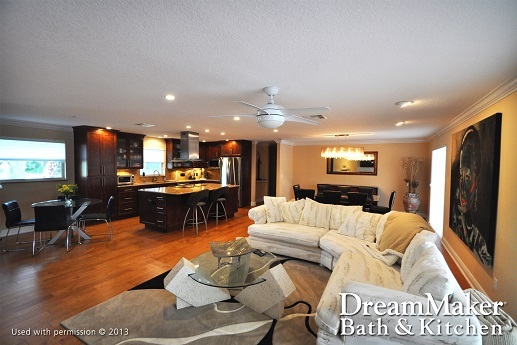 At DreamMaker, our goals are your goals – to design and build the kitchen, bathroom or other space of your dreams. Your project manager will be right there with you every step of the way to answer your questions and make the entire experience hassle-free. When you choose to remodel your home, your DreamMaker project manager will discuss the cost of your ultimate kitchen or bathroom remodel and help you meet your goals without any hidden surprises. To begin the process of planning your dream remodel, call DreamMaker Bath & Kitchen of Charlotte at (704) 270-2166 or submit our online form to start a conversation.